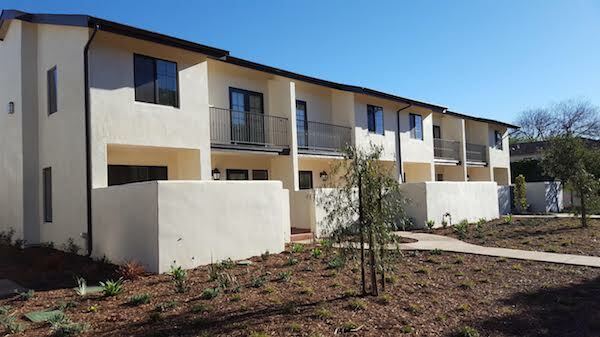 As an early adopter of a U.S. Department of Housing and Urban Development (HUD) program designed to keep affordable housing units from converting to market-rate housing, the Housing Authority of the City of Santa Barbara (HACSB) announces the completed renovation of its Pearl Gardens and Sycamore Gardens family housing properties. This successful implementation is the latest example of why the Housing Authority has earned a national reputation for innovation and excellence in its approach to affordable housing and community services. Overall, this new model will preserve over 496 units of affordable housing for working families and low-income seniors and veterans in Santa Barbara. Home to a total of 35 families, Pearl Gardens and Sycamore Gardens received new energy efficiency appliances, new windows, roofing, siding, flooring, cabinets, tankless water heaters and photovoltaic solar panels to reduce electric grid burden. The public-private rehabilitation project was made possible through the HUD Rental Assistance Demonstration (RAD) program in combination with funding through the Federal Low-Income Housing Tax Credit Program. This marks HACSB’s first renovation completed under RAD, which was created in order to help preserve the nation’s affordable housing inventory. Built in the ‘70s, Pearl Gardens and Sycamore Gardens were repositioned out of the Public Housing Program through the RAD program, which allowed HACSB to leverage the private capital market to make these much needed improvements. The RAD program began in 2013 and was created in order to give public housing authorities a powerful tool to preserve and improve public housing properties and address the $26 billion dollar nationwide backlog of deferred maintenance. Pearl Gardens, located at 13-21 South Soledad Street, consists of 15 family units comprised of 12 three-bedroom and three four-bedroom units. The property is situated on a 1.17-acre site and includes on-site parking, private patios, open space and a play area for children. Sycamore Gardens, located at 211-221 Sycamore Lane, sits on a 1.68-acre site and consists of 20 three-bedroom townhouses. Amenities includes onsite parking, open space and laundry facilities. Project partners, lenders and consultants include: SB Housing Partnership IV, L.P., whose General Partners are Garden Court Inc. (Managing GP) and 2nd Story Associates (Co-General Partner), both California 501c3 Corporations; MUFG Union Bank, N.A. ; California Community Reinvestment Corp; Paul Thimmig of Quint & Thimmig; Adam Diskin and Russell Hirsch of DH&G; Mark Manion – Price, Postel & Parma.